It was mid-December 2015 when James (Jay) North learned that the vendor-based market where he sold his home décor and antiques was being shut down. He and the other vendors were facing the end of their small businesses. Not willing to accept this, Jay and a committed group of owners stepped up to create a new organization that would serve the local business community. They sought guidance from the Shenandoah Valley SBDC and advisor Sara Levinson, who lives and works in Page County. The first item of business: establish The Hawksbill Trading Company as a co-operative. According to Jay, without the SBDC’s guidance this would never have been possible. The new board worked diligently with Sara to create membership applications and vendor contracts, draft by-laws and other organizational documents, set up a new accounting system, and manage all the other aspects for a new venture. 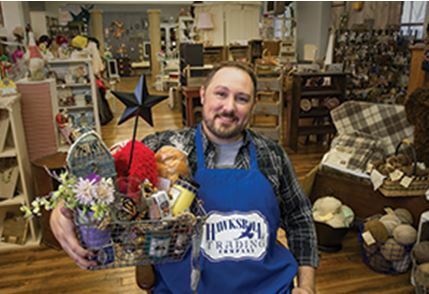 The new business opened its doors on January 20, 2016 with 20 local vendors selling antiques, jewelry, up-cycled furniture, original art, home goods, meats, and produce. Unlike many “mall-type” markets, HTC does not work around pre-defined stalls or booths. Some vendors need only a few shelves for their products; others need lots of floor space, so HTC’s board works hard to find the right space and lay-out for each vendor, which allows businesses of all sizes to participate. One year after opening, HTC hosts nearly 60 vendors. Merchants and local artisans offer a variety of workshops in everything from essential oils to painting to fly-tying. HTC is a thriving hub of entrepreneurial spirit and activity – a place to share ideas, gather resources, be inspired, and find support. In partnership with the SV SBDC, HTC offers business development resources to budding entrepreneurs throughout the community. Together they are partnering with Page County Public Schools to conduct the Young Entrepreneurs Program in 2017, and plan to expand their cooperative retail model to the food and service sectors in the future.